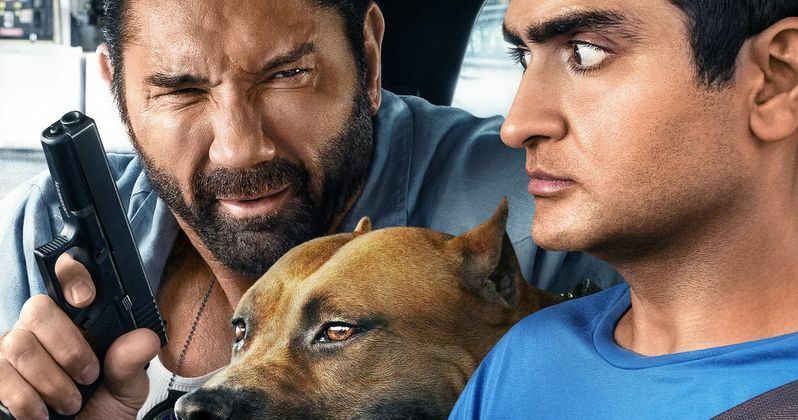 Stuber arrives as one of the first 20th Century Fox movies released under the new Disney regime. So technically it's a Disney movie, and was recently touted at this past week's CinemaCon. The comedy had its world premiere in March at the SXSW film festival, where it was praised for its action, comedy and especially the chemistry between its two leads, Dave Bautista and Kumail Nanjiani. This isn't the only twisty buddy comedy coming from Dave Bautista in the next couple of months. Just last week, we were treated to the first trailer for the espionage action comedy for the whole family My Spy, where Bautista takes a young spy wannabe under his wings. In the movie, A hardened CIA operative finds himself at the mercy of a precocious 9-year-old girl. Dave Bautista is also expected to show up as one of the fallen heroes in this April's Avengers: Endgame, where he will reprise his Guardians of the Galaxy character Drax. Drax was decimated in Infinity War, and his return isn't guaranteed. But it is known that he'll show back up in Guardians of the Galaxy Vol. 3, which just rehired director James Gunn and is officially a go. Interesting enough, Marvel could give us a Dave Bautista and Kumail Nanjiani reunion sometime in the future, as Nanjiani is reportedly wanted for a role in the upcoming MCU movie The Eternals. But before that happens, we can enjoy the two unlikely comedic presences in Fox's Stuber, which unites them in what is technically their first Disney movie. You can also see the poster below which lets us in on exactly what kind of ride we're in for. This trailer and poster come direct from Fox.